Columbia Paint can help you find the perfect colors for your home! Your paint color choice has the power to put the finishing touches on an interior design. Owners that are preparing to put their homes on the market should consider the impact that color has on potential buyers when they walk into a room. It can directly influence the atmosphere inside the home and make it feel warm and inviting. Follow this guide for how color can benefit your home staging process! Every great execution came from a carefully thought out plan. Before you stage your home, you should work with your interior designer to create a plan that gets it ready for sale by creating a great color palette. This palette will be home base for the rest of your design choices as your reference point. It will help not only with paint choices but furniture as well. Use color to tell a story with your staging. Help buyers see themselves in your home on a daily basis and going about their normal activities. The story should be welcoming and comfortable. For the style choices, consider the demographics in your area and home buying trends to get an idea of what type of buyers would be looking at your home. This will help you make some decisions about whether you should stick with a conservative palette or if it would be worth it to take a risk. As important as color choice is in your interior design, there is a such no thing as too much color. This idea includes more than just your paint color, but your furniture choices as well. Help potential buyers focus on your home and not the quirky, bright elements that you’ve found to fill the rooms. Organization goes a long way and simplicity helps buyers picture adding their own style to the space, with their own furniture pieces. Be careful not to draw too much attention away from the details of the space to your design choices; they should serve as a base. 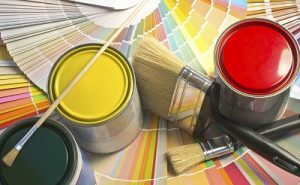 Columbia Paint Company is happy to help you choose the perfect color for your painting project and offer you tips for every step of the way. Not sure how to make sure your siding, trim, and accent colors match? Need to see the paints you loved online in person? Schedule an appointment today by calling 443-319-4001 or visiting us online. For more painting tips and updates, follow us on Facebook, Twitter, Google+, LinkedIn, Houzz, YouTube, and Pinterest!